Water sharing between Central Asian countries has been conflicting for quite a long time already. While most of the international attention has focused on problems of water sharing in large rivers such as Syrdarya and Amudarya, hundreds of smaller transboundary river basins (STR) shared by riparian countries also need to be taken into consideration. Water management in such basins have an important impact on future security and sustainability of the region as they contribute up to 30-35% of the irrigation in the region and living place of 1/7 of total population of Central Asia. Therefore, it is of crucial importance to work on these “forgotten” basins in order to provide sustainable solutions. During Soviet Union, water resources management was more of an administrative matter with only a few problems, mainly of technical character. However, after disintegration of the Soviet Union, water sharing between countries became more of a political issue. This situation had negative implications for livelihoods of people who depend from these transboundary rivers for food security, livelihood sustainability and else. Absence of institutional system for joint water management between riparian states led to unequal water distribution among all interested sides (wealthy and poor, large farmers and smallholders, and irrigation vs. non-irrigation water use). At present none of such transboundary basins have short or long term water management plans, resulting on water overuse and water scarcity. Moreover, other problems persist on these STRs such as lack of capacity; border demarcation; scattered, unavailable or inaccurate information and data; complicated and underdeveloped procedures of interstate cooperation (mostly bilateral) on STR basins. In most cases water sharing agreements of Soviet time are violated by parties. 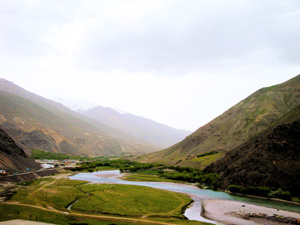 Transboundary Water Management in Central Asia (TWMCA) programme by GIZ has proposed an Integrated Water Resources Management for Small Transboundary River Basins (IWRM TRB) concept which builds up on principles of integrated water resources management. The cornerstone of the concept is that cooperation on transboundary water management should and could occur on river basins with involvement of riparian states in joint planning and implementation of basin plans. The proposed concept has three interlinked components: (i) preparation of a legal basis for transboundary cooperation, (ii) development of institutional infrastructure for such cooperation and (iii) enabling institutional infrastructure. The concept helps to delegate most of the aspects of water management into jointly established river basin organizations (RBOs). Establishment of RBOs such as river councils, river basin commissions, etc. is a natural step towards IWRM in the transboundary basin. Thus, structure, representation and functions of RBOs have to be thoroughly and lengthily discussed by riparian state representatives, including a sufficient group of water users from all concerned states. Another aspect of the concept is development of institutional capacities for joint river basin management. Therefore, tools to assess, plan and implement basin plans are crucial for the intervention strategy of the TWMCA programme. Established temporary secretariats for transboundary cooperation facilitated meetings and documented the progress on transboundary cooperation. Databases and land use maps for respective parts of the basin have been carried out by WMOs of both parts of the basin. Public hearings, involvement of water users, public information campaigns are crucial components of public participation. These are all building blocks for future, successful water management cooperation in selected intervention basins. It is quite obvious that without harmonious and cooperative environment in numerous small transboundary watersheds Central Asian states will be hard to establish regional cooperation for the two large river basins. The example set up by successful cooperation in smaller river basins may well drive more cooperation at regional level. However, one should keep in mind that although transboundary cooperation is a political process, role of the local communities in smaller basins is tremendous for sustainable cooperation. Without proper legal and institutional space for such cooperation attempts to build up joint river basin organizations in STRs may fail with no success. Monthly Focuses: Each month, the Amu Darya Basin Network website will feature a new discussion, under the Monthly Focus. The main purpose of the Monthly Focus is to look deeper into particular questions on water management and transboundary cooperation in the Amu Darya Basin, and generate informative discussions on the selected topic. The Monthly Focus will also be linked to relevant literature, facts and figures and to relevant experts of our network. If you are interested in raising a particular topic for online discussion, please send an email gjumamuratova@ewi.info. The request should include 500-800 words describing the issue and posing a question for debate, and should be accompanied with one relevant image. Do you think we can build transboundary cooperation in Central Asia on bigger rivers taking lessons from existing cooperation on smaller transboundary rivers?